Quick breads have always been one of my very favorite things to do in the kitchen because they’re typically an easy mix, pour, and bake recipe and involve ingredients I have on hand. This means I can get to baking whenever the desire strikes, or in the case of this recipe, whenever the bananas get a little too ripe. 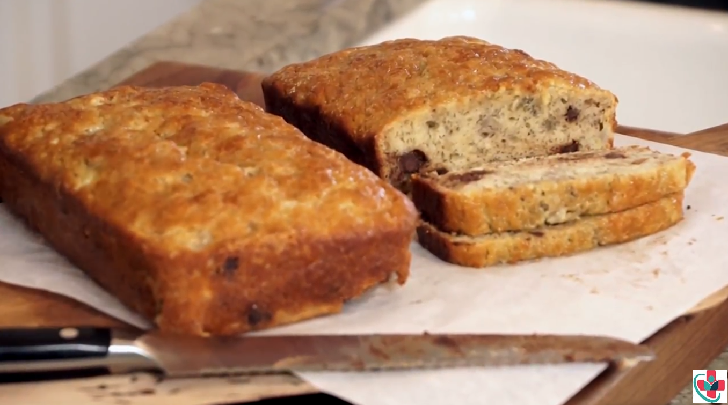 This bread bakes into a beautiful, golden brown loaf of banana bread that is spiked with chocolate chips. Sour cream (mala) does it’s magic and adds wonderful texture and flavor. Preheat oven to 375°F. Spray the two 8x4 loaf pans with baking spray; set aside. Peel and mash bananas with a fork; set aside. Beat sugar, sour cream, butter, and eggs together in mixing bowl on low speed for 1 minute. Beat in flour, baking soda, and salt on medium speed for 1 minute. Beat in bananas and vanilla on low speed for 30 seconds. Stir in chocolate chips by hand. Spread batter in prepared baking pan and place in center of preheated oven for approximately 35-40 minutes or until lightly brown on top and toothpick inserted near center comes out clean. Cool slightly then turn onto a serving platter or cake plate; cut into slices when cool and serve.